Wales' Lee Selby fought on with cuts above both eyes to beat Omar Douglas in his first bout at lightweight. Selby, 32, moved up two weight divisions after losing his world featherweight title to Josh Warrington in May and ground out a points win. Head clashes in the second and seventh rounds posed problems, but he took a unanimous 116-112 116-112 115-114 win. Britain's Joe Joyce showed impressive punch volume to stop former world heavyweight champion Bermane Stiverne. Stiverne, 40, lost the WBC world title to Deontay Wilder in 2015 and arrived at London's O2 Arena for his first UK fight at a career-high 19st 7lb. He caught Joyce in the first but quickly became an easy, if durable, target as Joyce landed shots at will, dropping the Haitian-Canadian with a right hand in the third. Under consistent assault with his back to the ropes, Stiverne somehow soaked up punches until the sixth round when referee Howard Foster stepped in to end the contest and seal an eighth win of Joyce's professional career. "Big respect to Bermane Stiverne, he's very tough and stuck in there but I guess I was just too much," said Joyce. "It was about being patient as he's such a tough guy he took all those shots. There are big things to come." While Joyce offered pressure and dominated, Selby needed much of his well-documented ring craft to box his way to a 27th win from 29 contests. 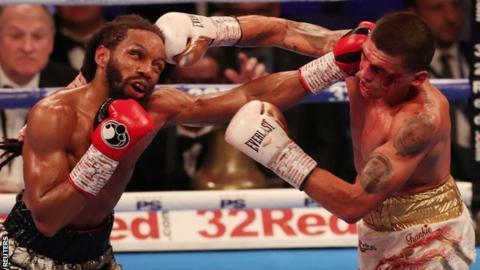 Selby, who was cut badly when he lost to Warrington at Elland Road, said Douglas proved "one of the toughest" opponents he has faced and blamed himself for the head clashes. "When he was rushing in he was dangerous with the head," said Selby. "I have two highly experienced cuts men in the corner but in the fight I kept undoing their work. I am a former world champion and I'm still learning." Douglas, who fell to a third loss in 22 fights, offered pressure and looked confident early on, landing solid shots to the body. But he had never gone 12 rounds and late in the contest, Selby's judgment of distance saw him evade shots smartly to land eye-catching work. "I believe I can win another world title," added Selby. "He was supposed to be a big puncher and I held his shots well. I have a lot to learn, have great trainer and I just want to fight anybody. If they said I was fighting Anthony Joshua tomorrow I wouldn't tell them no."